The tournament raised $32,679 for the Center for Leadership Development. Photo by Abby Glaws. 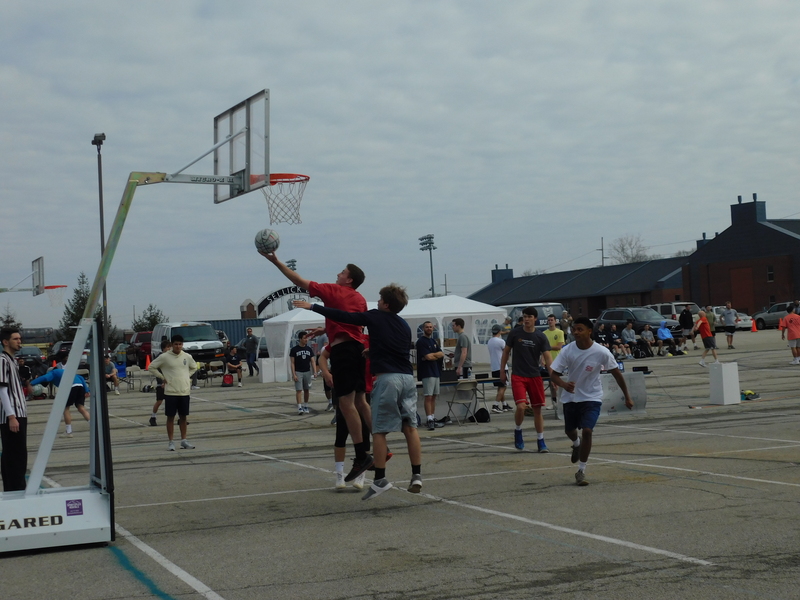 On April 6, 64 teams competed in a three-on-three basketball tournament outside of Hinkle Fieldhouse. Players came from as near as Indianapolis and as far as Alabama to compete for the pride and glory that comes with winning this spring tournament. This was the first Ball so Hard Basketball Tournament at Butler University. Proceeds will benefit the local Center for Leadership Development, an organization that aims to empower minority middle and high school students in central Indiana through personal development and educational attainment. The tournament, in tandem with a Go Fund Me campaign and sponsorships from local businesses, has raised $32,679 for the organization. As of April 8, just $1,445 of that total amount was raised through the Go Fund Me campaign, which will likely remain open through the rest of the school year. The rest of the money was raised from local sponsors and the entry fees players paid to enter the tournament. Expenses from the tournament have not been deducted yet. To play in the tournament, players had the option to pay $45 to enter as a team, $30 as a duo or $25 to enter as an individual. This money went towards the total raised for the Center for Leadership Development and the $1,500 for the winning team. For brothers and co-founders George and Robert Kirch, the tournament was the culmination of months of organizing and planning. First-year George and junior Robert are both entrepreneurship majors with second majors in finance and marketing, respectively. The Kirch brothers originally started hosting tournaments when they were in middle school with friends in their neighborhood. Eventually, more people became interested in participating and the tournaments grew. When they started high school at Cathedral High School, the school required students to participate in community service, which is when the Kirch brothers’ work with the Center for Leadership Development began. Mitch Purlee, a senior finance and economics major, played on a team that made it all the way to the championship game. Purlee said he especially enjoyed the outdoor atmosphere and the three-on-three style of the tournament. The tournament received attention beyond Butler’s campus as well. The Kirch brothers reached out to friends and family members to spread the word about the tournament, including the friend of one of their old babysitters. That friend was Robyn Hayward, wife of Butler legend Gordon Hayward. Through this connection, the brothers were able to get the current Boston Celtics player to give the tournament a shoutout to his 1.5 million followers on Instagram. This may have factored into why players came from as far as Alabama to play in the tournament. Even the winning team was made up of students from other area schools. Chandler Gunnell, a senior finance major at the University of Indianapolis, was one of the players on that winning team. Gunnell said he heard about the tournament from friends and decided to form a team. The prize money was raised using the entry fees participants paid to compete in the tournament. “We played for 45 bucks a team, so if we lost it went to a donation and if we won, we won $1,500 so it was kind of a win-win either way,” Gunnell said. Due to its success, the Kirch brothers are already planning to organize the tournament again next year.